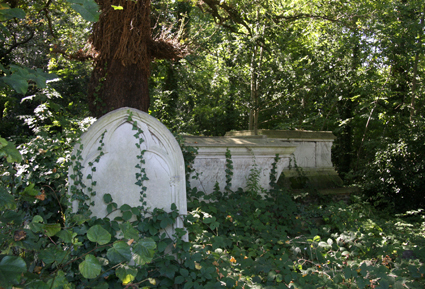 Highgate cemetery, in North London, might be famous for its Gothic tombs but before that was built West Norwood Cemetery, in South London, was created as the UK's first Gothic cemetery - and I think it is just as impressive. Back in Victorian times there was a real problem of where to bury the dead. City graveyards were overflowing with corpses - quite literally. Seven magnificent new burial grounds, including West Norwood, were constructed around the edges of London to cope with the surfeit. The others were Kensal Green, Abney Park, Brompton, Nunhead, Tower Hamlets and Highgate. They became known as The Magnificent Seven Cemeteries. 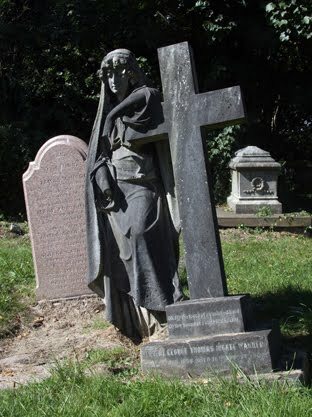 Famous people buried at West Norwood include cookery writer Mrs Beeton, natural historian Gideon Mantell, inventor of the automatic machine gun Sir Hiram Maxim and potter Henry Doulton. You can see the inscription on the Doulton terracotta monument in the photo to the left. 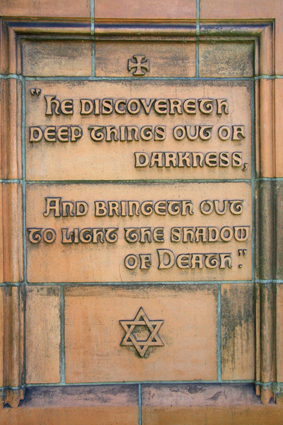 It states: "He discovered deep things out of darkness, And bringeth out to light the shadow of death." Sounds rather magical. 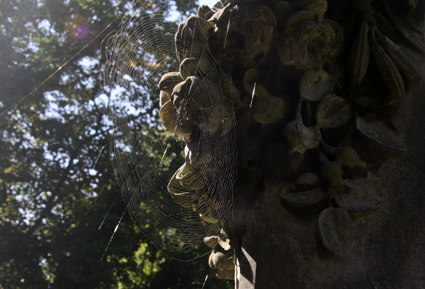 I visited West Norwood Cemetery on a sunny Sunday last month and took the photographs you can see on this page, as well as visiting an art installation called the Streetscape Carousel, which displayed silhouettes of the Magnificent Seven cemeteries on the walls within West Norwood's Greek Chapel. I blogged about the carousel a couple of weeks ago, and you can see pictures of it here. The small photo to the top right shows the outside of the Greek Chapel - an impressive neo-classical structure based on the Parthenon, which makes a striking contrast against the primarily Gothic architecture in the rest of the burial ground. These days, as well as still housing a working crematorium, the West Norwood cemetery distinguishes itself from rest of the Magnificent Seven by being an art venue. 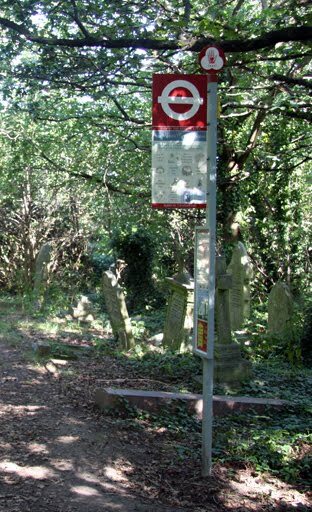 One of the oddest things in West Norwood Cemetery, which took me quite by surprise when I spotted it, is a bus stop named "The Last Request". When I saw it, I was half expecting to then see some Harry Potter style magic bus turn up to take departing spirits on their journey off to the next world. I later learnt the bus stop was left from an art installation back in June, called The Curious Trail. The cemetery also hosts theatrical and musical productions as well as talks. The next talk is on Saturday 17 November and could appeal to steampunk fans and other admirers of Victorian engineering. Paul Dobraszczyk of Reading University will be talking about Charles Henry Driver (1832-1900), a Victorian architect who designed many railway stations and, with Bazalgette, designed Crossness and Abbey Mills pumping station. Dr Dobraszczyk is the author of a book calledInto the Belly of the Beast: Exploring London's Victorian Sewers. 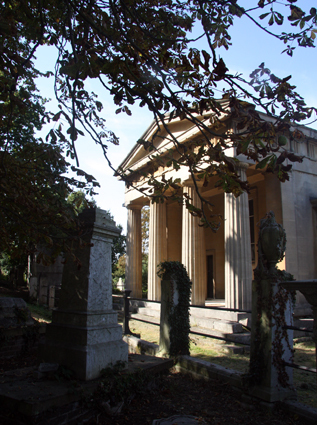 The Friends of West Norwood Cemetery, who help organise and run the artistic and literary events at the cemetery, love people to visit it to admire the wonderful architecture even when there aren't special exhibitions or talks taking place. And Hallowe'en, or Samhain as pagans call it, would be the perfect time for a walk amongst the Gothic tombs to admire their beauty and to pay respects to those buried there.